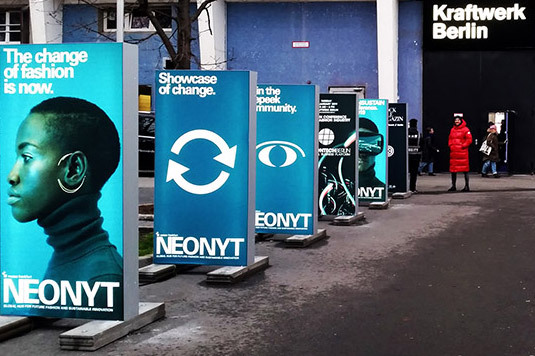 A mixture of conference, fair and fashion show – Neonyt, formerly Greenshowroom, a B2B event during the Berlin Fashion Week is all about sustainability in fashion. “CHANGE. FASHION. TOGETHER” was the theme of this year’s neonyt hub and the CSCP was in the middle of the action representing the Siegelklarheit project. Sustainability in the textile and fashion industry is a central topic that all major fashion labels have picked up. Nevertheless, consumers find it hard to distinguish labels and designers that have simply jumped on the bandwagon from those that actually walk the talk. At the same time, designers might find it difficult to market their products credibly when the extra effort in time and sourcing drive up prices. Siegelklarheit, the information platform for sustainability labels aims to make it easier for consumers, designers and retailers to assess the validity of labels and what aspects they cover. With our presence in Neonyt’s Knowledge Lounge, interested visitors, including manufacturers, bloggers and influencers, were informed about the opportunities that labels and a central platform such as Siegelklarheit can provide – especially when it comes to understanding environmental and social impacts within the flood of textile labels. 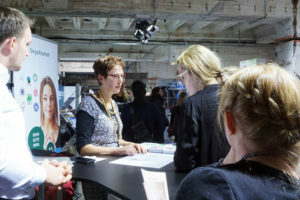 Visitors were very interested in Siegelklarheit’s potential and Neonyt proved to be a vibrant environment with many young designers, shop owners and big names who are pioneering the fields of slow fashion, circularity in fashion, upcycling, and working with natural materials among others. For further questions, please contact Stephan Schaller.